Canada's only independent major-market TV station has carved out a unique market niche and hopes to be profitable in two years, say its backers. Vancouver-based Channel M serves the region's burgeoning ethnic market in Greater Vancouver and Vancouver Island. From a storefront location in the heart of Chinatown, its broadcast schedule is a combination of local and syndicated English programming. Local programming includes production of 55 hours weekly in 22 different languages by an in-house staff and independent producers. CEO Art Reitmayer’s Channel M is serving the region’s burgeoning ethnic market in Greater Vancouver and Vancouver Island. "I really believe that Vancouver is the right marketplace for an ethnic station," says philanthropist and shareholder Joe Segal. "The ethnic population is over a million in Vancouver and that is probably 50 per cent of the total population. "I perceived it to be an opportunity. It's not easy investment, the media business. It takes a long time to create a revenue stream. You don't get rich on this overnight, but we are on target as far as our plan is concerned." The attempt by major broadcasters to get a toehold into Vancouver's multicultural scene dates back to 1997 when Rogers Communications Inc. of Toronto first sought a license, but failed. The company tried again in 2000 and 2001, but the federal broadcast regulator chose Channel M instead and on June 27, 2003, it hit the airwaves. Channel M president and CEO Art Reitmayer says the channel's syndicated programming includes Law and Order, the Tony Danza show and The Simpsons, among others. "We air The Simpsons at 6 p.m. and it does relatively well in the ratings . . . it gets two rating points." The two major rating services in Canada, BBM and Nielsen, only rate English shows and not multicultural programs, he says. "This is a policy of theirs." The $13-million channel is controlled by six local shareholders, each with 18 per cent equity, and Reitmayer with 10 per cent. Jatinder Rai, general manager of Response Advertising Inc. of Richmond, a firm specializing in serving the growing multicultural advertising market, says the station's Chinese and Punjabi newscasts are serving "a real need in the community" by providing a local and province-wide perspective to its audiences. "A lot of the ethnic media have focused on what's happening at home more so than what's happening in the local community. 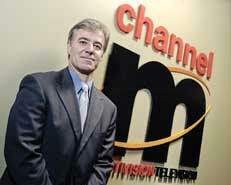 Channel M brought a lot of credibility to the ethnic and multicultural market in Vancouver." Alice Lee, manager of niche marketing at Telus Mobility, a division of Telus that advertises on Channel M, says the multicultural market is very important. "It's a good opportunity for us to reach an ever-growing and important market and it is a lot cheaper than the mainstream media." Telus Mobility's two big target markets are Chinese and South Asians, who are mainly East Indians, she says. "We have been working with Channel M shortly after it went on the air in 2003." Given the need for in-depth knowledge of the multicultural marketplace, Rai says his company is poised to fill the need. "Our expertise is that we understand the cultural nuances of the ethnic communities and we give our clients that relevant multicultural perspective that the mainstream agencies often can't provide. We understand the mainstream and ethnic market. Not that many people understand both." Vancouver businessman James Ho, who owns a local multicultural radio station, was responsible for putting the investor group for Channel M together. "We've known each other for a long time and I chose them because all of them have been major contributors to the community." Reitmayer started in broadcasting in 1984 and rose rapidly through the ranks. By 1999, he had one of the top broadcasting jobs in the country - president of 10 television stations owned by WIC of Vancouver, a company eventually taken over by CanWest Global of Winnipeg. He spent time with CanWest as vice-president of special projects, involved in the integration of the corporation's newspaper and TV operations. By May of 2002, he had brought together the core group of managers for Channel M.
Hardeep Virk, a small business owner in Vancouver, says he is impressed with the station's unique perspective. "It's a good concept. It's really refreshing to see the various multicultural groups on the station. I especially like the ads that show the diversity of the staff they have." He enjoys the station's Punjabi newscast, but finds the presentation a "bit stiff." "Their Punjabi newscast's coverage is comprehensive and understandable to everyone," adds his wife, Simran. "They have a multi-national crew. My family talks about it frequently and they think it's awesome." News viewership among the station's multicultural sector is high. A Channel M-commissioned survey this past summer by Ipsos-Reid revealed that 62 per cent of the local Punjabi population watched Channel M's Punjabi news, 41 per cent of the local Mandarin population watched the Mandarin newscast and 31 per cent of the local Cantonese population watched the Cantonese newscast. Reitmayer believes the percentages are lower for the Chinese segment because there is an alternative service available, Fairchild Television Ltd. of Vancouver, a national ethnic specialty service catering to Canada's Chinese population. Last year, Channel M applied to take over the B.C. government's Knowledge Network, which delivers educational programming. The government sought proposals from the private sector to buy it and Channel M was one of several bidders. Other competitors included companies controlled by Vancouver businessman Jimmy Pattison and Toronto broadcasting mogul Moses Znaimer. Although the government indicated it would make a quick choice, a decision has yet to be made.